Most beef producers are well aware of the importance of trace minerals. Minerals play a part in almost all vital bodily functions, including growth, health, and fertility. Cow-calf producers are often the main segment of the beef industry to utilize an established trace mineral program. Bovine respiratory disease (BRD) is well established as the major source of lost income in the post weaning segment of the beef industry. Producers lose money not only due to death loss, but also due to reduced performance and treatment costs of sick cattle. The immune system of newly received calves is often extremely susceptible, due to both stress from weaning and transportation, and exposure to new diseases during that weaning and transportation process. It has been well established that both of these interact with nutrition, both previous and current. At least 17 different mineral elements are required for cattle in their diets. These minerals are classified as either macrominerals (major minerals) or microminerals (trace minerals), based on the quantities required in beef cattle diets. Macrominerals are simply required in larger quantities (grams per day) than microminerals (milligrams or micrograms per day). Macrominerals required by beef cattle include calcium, magnesium, phosphorus, potassium, sodium, chlorine, and sulfur. Required microminerals include chromium, cobalt, copper, iodine, iron, manganese, olybdenum, nickel, selenium, and zinc. Minerals content of forages can vary widely as well depending upon forage quality, soil, location, and time of year. Therefore, it is a good general management practice to provide cattle with a free choice source of mineral. 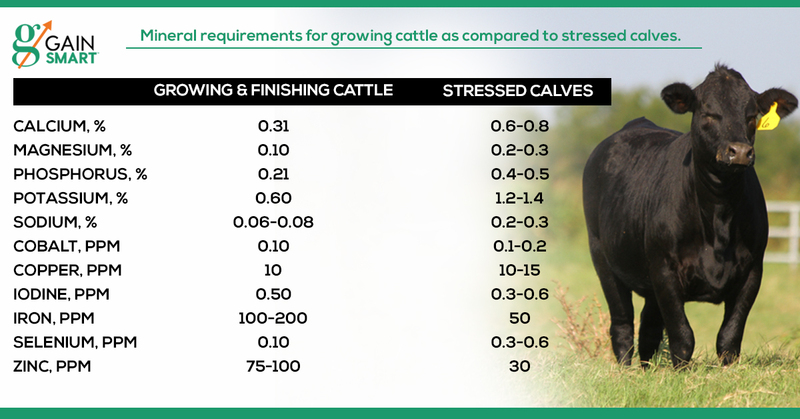 The receiving phase offers unique nutritional challenges as compared to other phases of a calf’s life. Proper nutritional management during this phase is critical to ensuring success and profitability. These calves are often stressed upon arrival, and will likely have low feed and water intake for several days after arrival. This is important when considering mineral consumption during the receiving period. Table 1 gives an example of how mineral concentrations should be higher when accounting for lower intake of stressed calves during the receiving period. Minerals delivery comes in a variety of forms. They may be fed as loose mineral, as part of a complete diet, top dressed on a ration, tub, or block form. 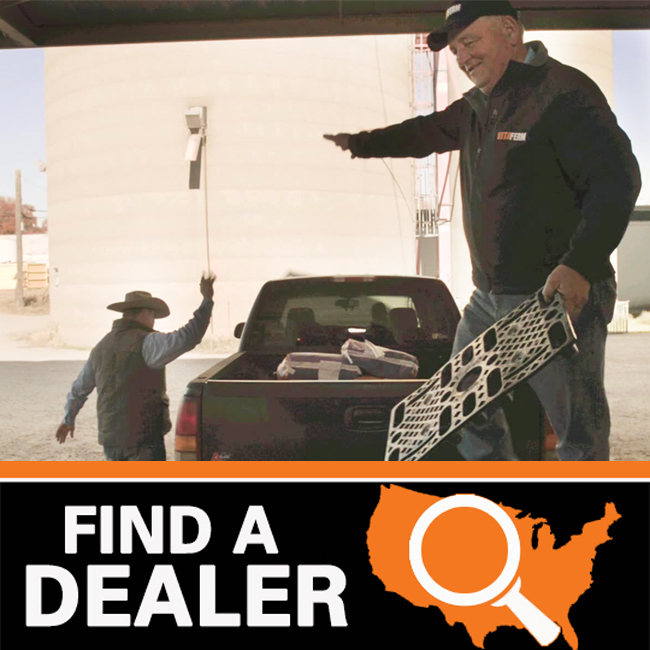 Deciding which form of mineral to select is highly dependent upon the type of cattle and the operation’s needs. Note that some blocks contain only trace mineralized salt, which will not meet the animal’s requirements for macrominerals such as calcium and phosphorus. Be sure to carefully read the label on a block supplement to be sure it contains all required minerals. Many loose minerals on the market today offer a compete supplement, and already contain salt to meet the animal’s needs. If your mineral supplement does not, it is important not to supply plain white salt, and mineral separately, as this may decrease intake of the mineral as cattle crave only the salt. Feeding a loose mineral also requires the use of a feeder or trough. Mineral feeders come in a wide variety of shapes and sizes, and there are options available for many situations and price ranges. Some minerals come in a weatherized form, which is less susceptible to the elements, and will require less protection from a feeder. In addition to the form of mineral provided, it is also important to consider the source of the actual mineral. For example, iron in a packaged mineral supplement may be in the form of iron sulfate, iron carbonate or iron oxide. While all of these sources contain some iron, it is not all available to the animal. Bioavailability rank of these iron sources from most to least available is sulfate, carbonate, and then oxide form. Iron oxide or rust has very little nutritional value, and is often used to give mineral supplements their signature red color. It is very important to read your mineral tag carefully to be sure that the source of mineral provided is available to your cattle. As a general rule, bioavailability of sulfates and chlorides is typically greater than oxides. However, there is always an exception to the rule, magnesium oxide is absorbed well enough to be used in beef cattle minerals. The majority of mineral supplements will offer minerals in the inorganic form, but there are several options offer mineral bound to amino acids or protein in the organic form. These are often referred to as chelates, complexes, or proteinates. Not all minerals are available in the organic form. Copper, zinc, cobalt, and manganese are the minerals typically fed in the organic form. However, it is important to note that organic minerals are more expensive than inorganic, and are generally not recommended to be fed year round. For the stocker producer, feeding an organic mineral form would be most beneficial during the receiving or pre-conditioning period. Finally, a good mineral program is only valuable if your cattle will eat the mineral. Proper management of mineral feeders is key. It is important to monitor intake of mineral to ensure cattle are consuming the recommended amount. It is also extremely important that the mineral supply, particularly for cattle on pasture, does not run out. If supplies run out, cattle are likely to over-consume minerals when reintroduced. Perhaps the most important take home message is don’t forget or skimp on your mineral program. A good mineral program is vital part of a good herd management program, and is vital for healthy calves that grow and perform! For more information about beef cattle production, contact an office of the Mississippi State University Extension Service, and visit msucares.com/livestock/beef. Galyean, M. L., L. J. Perino, and G. C. Duff. 1999. Interaction of cattle health/immunity and nutrition. J. Anim. Sci. 77:1120–1134.